In case you haven’t already heard, greenery 15-0343 is the Pantone color of the year for 2017. Pantone chooses a color that reflects the current cultural climate and once chosen has historically has influenced trends. However, its been my color for more than 7 years now. My wardrobe is full of it. I also carry a green phone case, tablet case, and contact lens case. Originally, I chose it for my branding to represent the clean and fresh design aesthetic that I strive to achieve. And, in 2009, Stop! 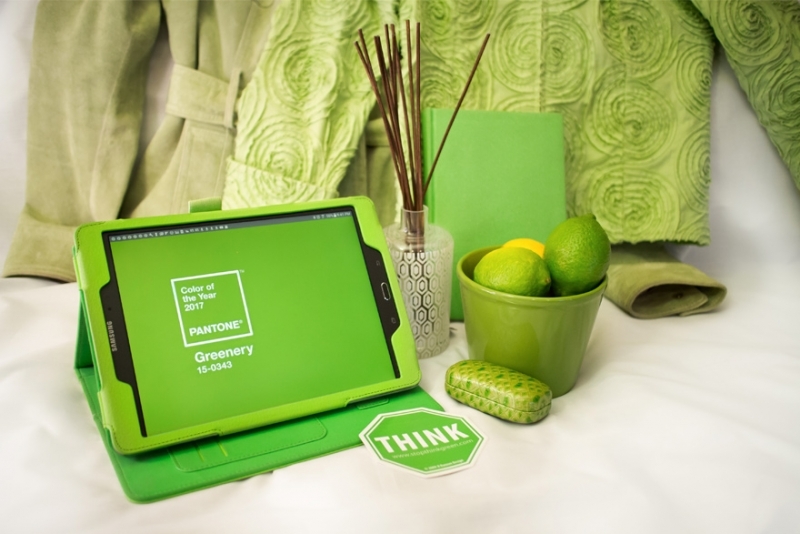 Think Green became my plea to care for our planet. Greenery is rejuvenation, restoration and renewed energy. Greenery is real, vibrant, hopeful and signifies beginnings. Doesn’t that sound like what we need right now? “This particular green is an unusual color: a combination of yellow and blue, or warmth and a certain cool,” she said. “It’s a complex marriage.” Which is probably putting what is going to have to happen in the current political climate mildly. My choice wasn’t at all a political statement, but it in the spirit of renewal, I am pleased to finally present my updated website which is full of fresh greenery. I hope you like it.